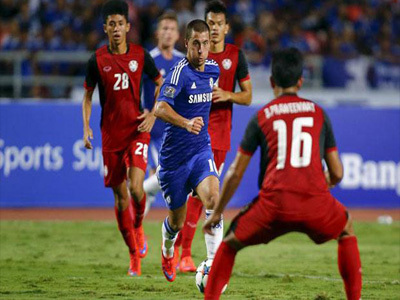 Chelsea’s up-and-coming youngsters got a chance to shine under sweltering Bangkok skies Saturday as the Blues survived a brief second half scare to dispatch the Thai All Stars 1-0. The English Premier League champions were visiting the Thai capital for the first stop on an end-of-season tour that will also take in Australia. Youngsters Izzy Brown, Ola Aina, Nathan Ake and Dominic Solanke all began the match pitchside, with the latter showing why he was named Chelsea’s academy player of the year last week. The 17-year-old hammered home a perfectly-executed volley in the 12th minute after a low cross from Aina, 18, received a light touch from Loic Remy before finding Solanke’s right foot. Kiatisuk Senamuang’s All Star team, made up of local premier league players, proved little resistance for the visitors. But they nearly caused some embarrassment in the 67th minute with an on-target shot kept clear by a brilliant header from Chelsea defender Andreas Christensen. Conditions for the visitors inside Thailand’s national Rajamangala Stadium were far removed from the more comfortable — and balmy — climes the Blues are used to in west London. With the mercury hovering around 34 degrees Celsius (93 Fahrenheit) even as night fell, Chelsea seemed in no particular rush to do much chasing and the drink breaks were frequent. Manager Jose Mourinho had to make do with flimsy plastic pitchside chairs instead of a plush Stamford Bridge manager’s box. English football commands a huge following in Thailand with Chelsea, sponsored by the local Singha beer brand, one of the favourites. Among the fans inside the stadium, blue shirts easily outnumbered the local team’s red strips. The second half saw some of Chelsea’s more experienced players take the pitch, including captain John Terry and injury-prone Diego Garcia, who was pulled off again after less than 20 minutes. Eden Hazard got a cheer from the crowd almost every time he went near the ball in the second half and the Belgian had a couple of close shots. The only yellow card of the evening went to All Star and Bangkok United defender Mika Chunuonsee after a fairly blatant handball halted what could have been a dangerous attacking run from Jeremy Boga. Chelsea leave Bangkok Saturday evening and fly straight to Australia where they face Sydney FC in another exhibition bout on Tuesday.